Posts tagged "Clean your Chimney"
It can get downright cold here in Cincinnati, Ohio, so it is well worth it to have a working chimney to keep you nice and toasty warm. Like everything else, vents need love too and to perform chimney maintenance and chimney cleaning in the frigid winter temperatures would be foolhardy. That is why summer is the perfect time to clean your chimney. In this short guide, you will be informed of the top five reasons that summer is the best time to maintain and clean your chimney. The best thing about summer being the perfect time to clean the chimney is that there are no freezing temperatures to contend with. If you were to sweep the chimney in the winter, you would be up on the roof, possibly with snow and ice in your footpath. This can be very dangerous. Make sure to perform chimney cleanings in the summer to avoid both cold temps and dangerous situations. When you sweep your chimney in the summer rather than the winter you have more available sunlight to get the job done. This is particularly useful if you have hired a professional chimney service team as they have more daylight to get your property cleaned as they are booked with chimney cleanings, chimney repairs, and chimney maintenance weeks in advance. As with all other repairs and maintenance of your home including roofing fixes, HVAC maintenance, painting, cleaning of the gutters, remodeling, or power washing, you need to set aside extra time in case something goes wrong or an unforeseen situation arises. By having the chimney maintenance performed in the summer, you have a few extra months in case your chimney inspection deems repairs that were not expected. The best time to inspect, clean, and fix the chimney is when it is not in use. 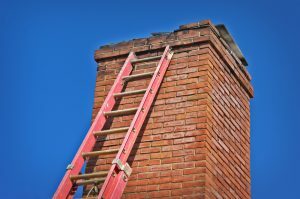 If you have the chimney inspected and cleaned in the winter, there is a possibility that an issue can be discovered which would possibly cause you to lose your heat. Since Cincinnati winters can get frigid, you do not want to be without heat. Make sure to have your chimney inspected and cleaned in the summer to prevent this. With the summer heat comes humidity. Humidity can mix with the soot in your chimney and cause an offensive and unpleasant smell that can enter your home and stink it up. It is best to have your chimney cleaned before the high humidity hits in the Cincinnati area to avoid the odor it can cause. As you can see, there are multiple reasons to do your chimney cleaning and chimney maintenance in the summer months. Whether it is to avoid odors, add extra time, or avoid the cold, you can bet your chimney will be looking brand-spanking new. If you are not interested in cleaning your own chimney, there are professional services that can perform the task for you. If you follow our advice on the top five reasons that summer is the perfect time to clean your chimney, your smokestack will be burning bright and toasty warm this winter!